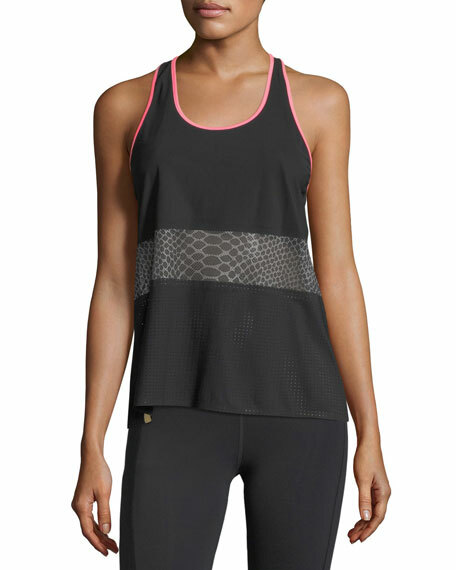 Monreal London tank in perforated jersey mesh. Tennis player and designer Stefanï Grosse founded Monreal London out of a personal desire for high-performance yet stylish tennis wear. Although the brand still has plenty of tennis-specific offerings, it has expanded to include a wider range of fitness and lifestyle piecesfrom yoga to golf. The brand's signature details include layered sports mesh, built-in sports bras with removable lightweight cups, and patent-pending concealed tennis ball pockets. Combining these functional features with luxury European performance fabrics and Grosse's own design sensibility, the brand has gained a cult celebrity following worldwide. For in-store inquiries, use sku #2466939.